Before the days of managed care, insurance plans were “indemnity coverage” that reimbursed patients for their out-of-pocket costs. Physicians billed the patients and got paid when the patients felt like making payment, usually only after the insurance company had reimbursed them. Often, the insurance money went elsewhere in the patient’s budget and the physician waited for payment. The not-so-good old days! With the advent of managed care contracting where physicians were paid directly by the insurance company, patient balance collections mostly disappeared. Today the pendulum is swinging back in the opposite direction, requiring practices to once again face the necessity to collect significant balances from patients. These plans are becoming increasingly popular due to their lower premium cost. Many of the policies purchased under the Affordable Care Act (the ACA, also known as Obamacare) feature high deductibles to keep the prices where individuals can afford them. Employers are now commonly offering HDHP as an option, which is being chosen more often by employees looking to keep their premium cost lower. Even though they are aware of their deductible when they set up their plan, patients have gotten out of the habit of paying their own medical bills and they quickly forget about their responsibility. This all puts physician practices in the position of having to understand and deal directly with patient balances like never before. Just as with other managed care plans, patients with HDHPs must still be sure they are receiving services ‘in network’ for their plan to provide coverage. The physician’s fee is based on the plan’s contracted rate but, unlike managed care plans, the responsibility for payment is with the patient rather than the insurance company until the deductible (which can be several thousand dollars per person) is satisfied. Then the plan pays the physician directly. The physician does not know whether the patient has yet satisfied the deductible or not. Earlier in the calendar year it is more likely the patient will be the one responsible, but this is never readily apparent. Unlike more traditional managed care plans, the ACA plans often have very limited coverage for out-of-network services. This is a big concern, especially for hospital-based services as we discuss below. However, the ACA provides that emergency services are always covered, and preventive services such as screening mammography are covered in full with no deductible. Radiologists and other hospital-based physicians are at a particular disadvantage when it comes to collecting patient balances because they often have no direct contact with the patient at the time of service, which is the best time to start the collection process. Imaging centers are better off, but many patients use imaging services only occasionally and therefore are not as committed to paying their radiologist as they might otherwise be about their primary care doctor whom they see more often. The hospital and the radiology group have a common interest in handling this problem together. Radiologists can take the lead by setting up a process that promotes the two-way sharing of patient demographic and insurance coverage information, which is critical to the success of both parties in collecting the full amount due. The radiology group also has to make sure it participates to the extent possible in all of the same insurance plans as the hospital. 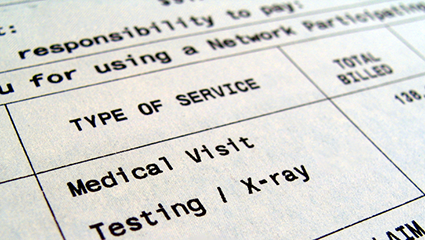 When the radiologist is out of network with regard to a plan, the patient usually will not have coverage and will have to pay the full amount of the charge out of pocket. This situation has become known as ‘surprise billing’ and many states are pursuing legislation that would prevent the radiologist from billing the patient or making it a requirement that the radiologist participate with all of the hospital’s insurance plans. Radiologists should be carefully attuned to activity in their state surrounding surprise billing or balance billing legislation in order to take proactive measures to protect practice revenue. The group can treat these out-of-network patients as self-pay and offer a discounted fee schedule, but the better situation is to be in-network as long as the contract rates offered are at all reasonable. When the radiology group cannot contract with a payer, it might be possible to work with the hospital to have them bill globally and pay the professional component to the radiology group. Unlike their hospital colleagues, radiologists in imaging centers have the opportunity for their own staff to interact with patients to avoid many of the challenges presented by HDHPs. They can have a conversation with the patient in advance of the imaging visit to obtain insurance information and reach an understanding with the patient about the cost and responsibility for payment. Often the patient initiates this conversation even before an appointment is made. Knowing that they will be responsible for some portion of the payment, patients today are shopping for the best balance between price and quality, although price might be higher on their priority list. Imaging center phone staff must be adequately trained to handle questions about price, insurance participation, and the possible payment arrangements. Verification of insurance coverage in advance of the visit is imperative, but even a diligent practice can get tripped up by quirks in the law. ACA plans must give the patient a 3-month grace period for premium payments before cancelling the policy retroactively. So, a physician could confirm coverage during the grace period only to find out that the policy was ultimately cancelled for non-payment. Collecting the full fee from this now uninsured patient will be a real challenge, calling for aggressive collection procedures. It is unlikely the patient will have the resources or intent to pay their medical bill if the policy was cancelled for non-payment. When it’s possible to determine in advance what the patient’s obligation will be, discuss with the patient how payment will be made before the appointment takes place. Some employers offer a Healthcare Reimbursement Account (HRA) along with their high-deductible plan, and other patients might have their own Healthcare Savings Account (HSA) to cover deductibles. In either case, payment is made using a debit card attached to one of these accounts, so time of service collection should be no problem. When it’s not possible to determine the amount due at the time of service, some practices are using a credit card reserve system. The credit (or debit) card information is obtained by the practice at the time of service and then the charge is put through once the insurance company has processed the claim and the balance is known. This would, of course, work with HRA or HSA cards as well. Many credit card processors will allow the cardholder to place a cap on the amount a vendor can charge to their account. Setting such a limit at the estimated amount of the charge will help the patient feel more comfortable with the arrangement. Despite the best efforts to collect at the time of service, patient balances will become a bigger part of the practice’s accounts receivable and some collection tactics will have to be implemented that are different from those used for insurance balances. Revenue cycle management professionals recommend that practices initiate an automated courtesy call after the second billing statement goes out to the patient. As accounts age, additional phone calls from practice representatives will be required for larger balances. When full payment is not immediately possible, the practice should be willing to initiate a time payment plan with the patient that uses automatic monthly credit/debit card charges. Regardless of the fate of the ACA, HDHPs are likely to be with us for a while. They present new challenges to radiologists to collect the appropriate fees for their services, whether performed in the hospital or the imaging center. Whenever possible, interaction with the patient is the best course of action to reach an understanding of the cost of service and the process expected for collection. Working with the hospital can go a long way toward achieving better collections for both parties. Our whitepaper, Five Potential Revenue Leaks in Your Radiology Practice, has additional ideas for maximizing revenue from both patient and insurance company balances. Subscribe to this blog to stay up to date on the changing environment of healthcare reimbursement and the specific impacts on radiology practices.